This Halloween our family was Boo’ed for the first time and it was so much fun. Sadly though, Halloween is not really my bag. It was cute for sure, but eyeballs and bones left at my door don’t really leave me feeling all mushy inside. You know what I mean? So, I thought to myself, “Self, how much fun would this be at Christmas time, only the best time of the year!” I am brilliant I tell you, absolutely frickin’ brilliant. *sigh* Sadly, I am also not alone in my brilliance because somebody already thought of it. 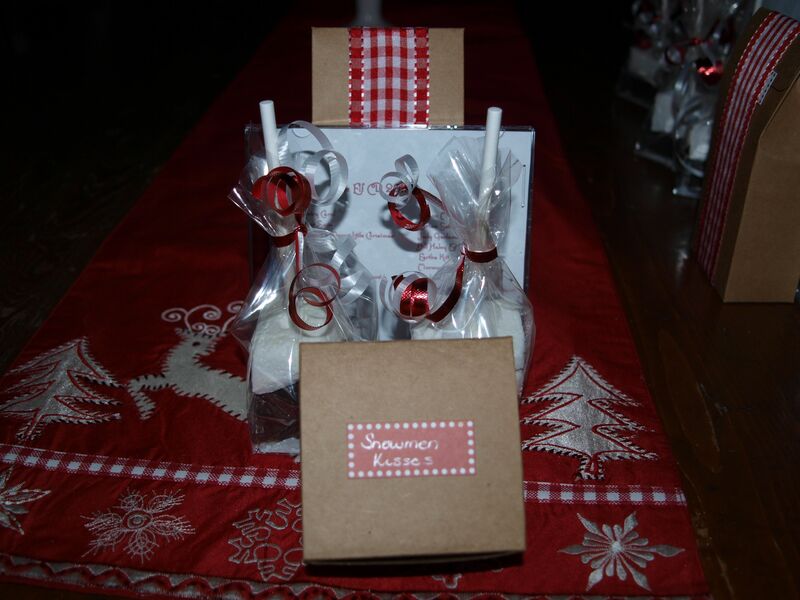 So, I plotted and schemed for a while as to what I would we would leave in our Elf Package this year and this is what I came up with: hot chocolate blocks, Santa’s Favorite Cookies, Snowmen Kisses, and a homemade CD with fourteen of our favorite Christmas songs. I placed all our homemade goodies in a brown kraft bag and stapled the note to the outside. Then I assembled the elves. The elves want to Elf their friends but I know that elves can’t keep secrets and that their friends would know who the culprits were faster than Santa Claus can deliver his presents. I insisted we pick people that the elves would be unable to inform of our good deed and that don’t read my blog! After we zeroed in on our targets was when the fun began. 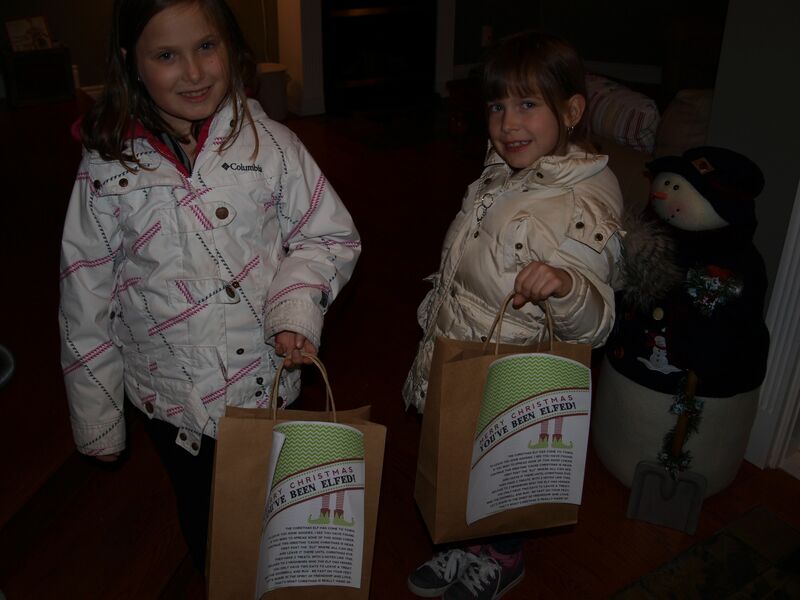 Elves ready to deliver the packages. Part of the fun of “elfing” people is trying to be stealth. The first delivery was hilarious. My youngest ran up, placed the package at the door, and then quickly ran back to the car, forgetting that you have to ring the doorbell. So we sent the second elf in, who failed to knock loud enough for anyone to hear. Finally on the third attempt, she finally knocked loud enough for someone to come. Picture me standing at the car, yelling “Run, Morgan, Run!”, then tossing her in the car, as all three of us yelled at my husband “Go, go”. We were killing ourselves laughing. 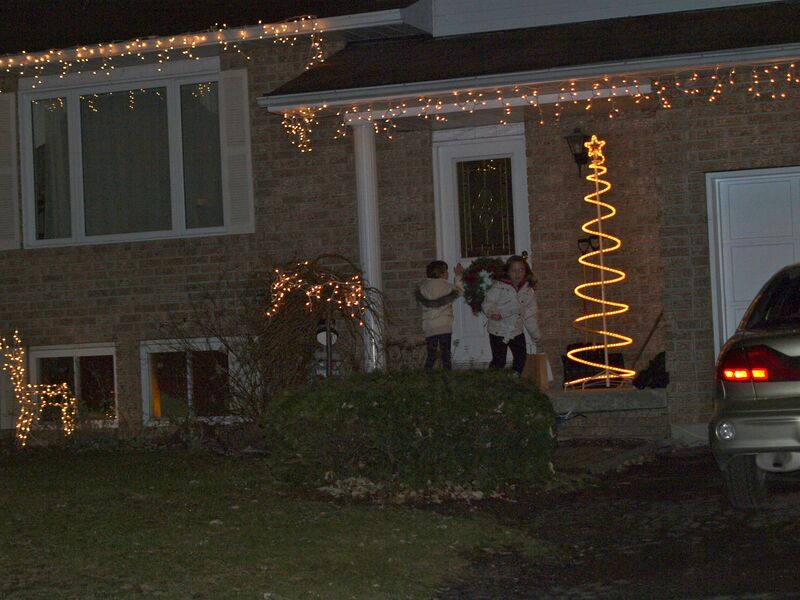 Not only did we do something nice for totally unsuspecting neighbours but we had a riot doing it. At the second house we thought it was best to send the elves together. One to drop the package, the other to knock on the door. The really fun part will be watching this grow now. Hopefully, we’ve chosen well, and those two families we “elfed” will in turn elf two more families so that 4 will become 8 and then 16 and so on and so on. Gawd, I love Christmas. Only 17 days until Christmas. How are you holidays going? What a cute idea, really wish I was your neighbour! So do I 🙂 Although we could never elf you because my elves would tell your elves. Terrible secret keepers these elves. LMAO….AWESOME!!! Will you come back and tell me about it? Candace, I love this. I could picture you and your little ones as I read. But some of my delight also came from reliving my own girls’ Christmases when they would bake and then deliver their goodies to the aged in our community. This is Christmas: not the malls, not the glitz – but the joy of being selfless and making others feel good. Thanks for the reminder. D.
We have a visit planned next week to St. Joseph Manor. The thing that breaks my heart this time of year is the people whose families have forgotten them, or that don’t have anyone left. GAH! Getting all misty over here. Thanks for stopping by Diane, always love seeing you here.